After a week of lament last week, today we take up a prayer of praise, confession, and wonder. Today’s readings are still of violent men (A response to Doeg the Edomite in Psalm 52) and of false prophets and hypocrisy (Ezekiel 13). We are still living in the midst of our faithless culture that denies God (Psalm 53.1-2) But we have reasons to move through lament to praise, as David does in Psalm 53. Our salvation has come. Not because we deserve it, but because God is merciful. Let us be glad. How can you love me? Of the thousand times I’ve tried to empty myself and be the child you created me to be, only rarely have I succeeded. Only rarely am I truly obedient. Only sometimes do I, through love for you, do the needed thing. I am no David, no Deborah, not even a Rachel. Yet You love me. I feel your pull with every movement in a leaf of one of your trees. Oh, Creator Love! You who teach all the melodies the dolphins of the sea sing to each other, how can it be that you condescend to love me, to save me, to lift me, to envelop me, to calm my fearful heart? 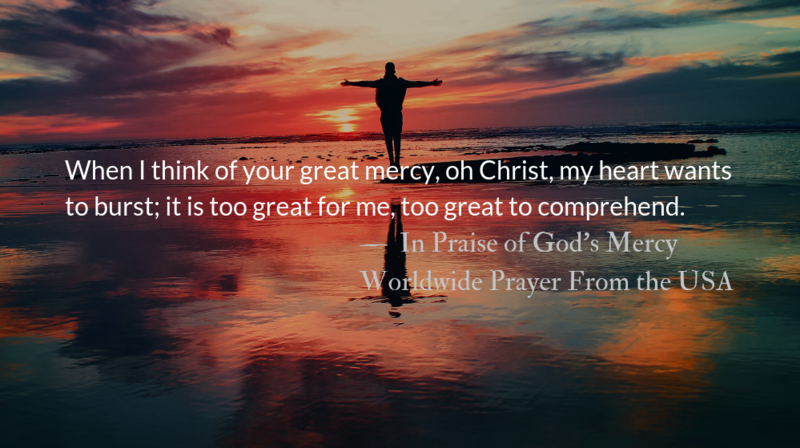 When I think of your great mercy, oh Christ, my heart wants to burst; it is too great for me, too great to comprehend. I could dissolve in tears of joy for knowing it. Oh, grand, great, infinite God! To kneel before you would be too presumptuous. Let me fall face down before you. That you love me? I cannot hold the thought. Yet hold me, dear God in your embrace, until I do know it. *Prayer from Hallowed be Your Name: A collection of prayers from around the world, Dr. Tony Cupit, Editor. – Prayer from The Divine Hours: Prayers for Summertime by Phyllis Tickle. Prayers from The Divine Hours available online and in print. May we embrace and treat with mercy and understanding those who struggle with mental illness. Today is World Suicide Prevention day. September is Suicide Prevention Awareness Month. May we join together to normalize seeking treatment of mental health issues and pray for those suffering. No, Frodo ‘failed.’…one must face the fact: the power of Evil in the world is not finally resistible by incarnate creatures, however ‘good’. Last month over 22,000 Park Forum email devotionals were read around the world. Support our readers with a monthly or a one time donation.